If there’s a water leak in your home, it may not be so easy to notice early on. 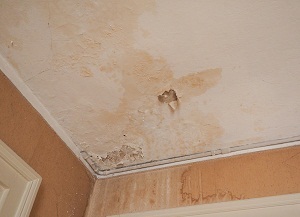 In fact, most water damage in your home hides behind your walls and under the floor, which makes it harder to detect. Fortunately, there are many ways you can catch water damage in the attic. -Water accumulation: If you’re standing in a pool of water, there’s probably a broken pipe in your home. Also, if you notice water stains or spots, that’s water accumulation that could be an indicator of water damage in your home. -Discoloration: On your walls or ceiling, there may be spots that look yellow or brown. This is a big sign that there’s water damage in your home, which can cause your paint or wallpaper to change colors. -Texture change: Water damage in your home can cause different surfaces to change the texture. For example, your wood flooring can blister, or your wall paint can bubble. -Walls: An easy spot to detect water damage are your walls. If you do notice changing paint colors or wet spots, there might be a leaky pipe on the other side of the wall. -Ceilings: Your roof is another common area for water damage to occur from a burst pipe or leaky roof from inclement weather. -Attics: If your home’s roof has a leak, it’s not a surprise that it happens in your attic. This can occur due to melting snow and ice, which can cause damage to your roof. -Floors: Many things can cause your flooring to become damaged due to water accumulation, such as a burst pipe, overflowing sink, or a damaged bathtub. However, to fix water damage on your flooring, you should consider water mitigation in Alpharetta.